The universe is made up of protons, nuetrons, electrons and morons. From 1900 to around the end of WW2, we see from the GISS data an increase roughly the same as the 1975 to 2017 period. From 1945 to 1975 there is a drop of around 0.3 degrees. Neither statement seems to be accurate. I think woodfortrees.org might be using a using a different base period to calculate the delta? By 1944 the temperature anomaly stood at an index of 21, or +0.21 degrees. By 1976 it had dropped to -11, but actually down to -20 for 1964. The point being, the trend in this data reverses for 30 years. In fact, it reverses twice during the period, whilst CO2 ppm does not. Annual average delta chart with 10 period MA. 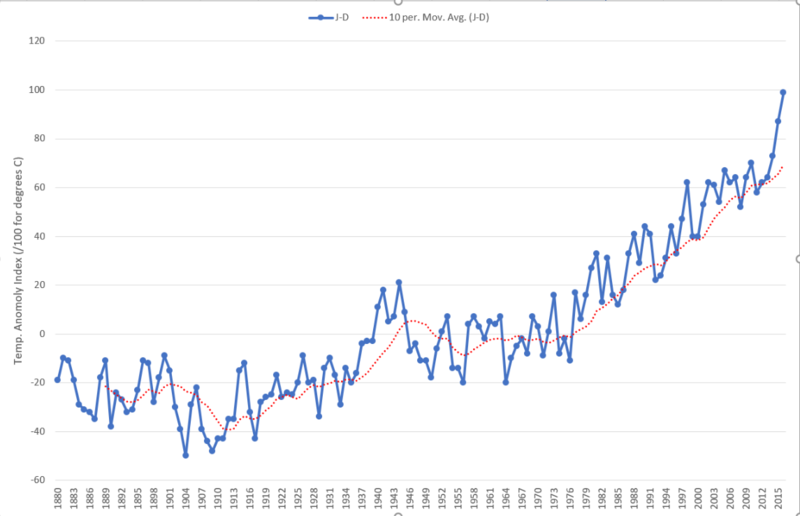 What evidence exists to make us sure that the next 20 - 30 years will not see a decline in temperature as happened after the significant run up from 1900 to 1944 (which is similar in scale to 1975 to 2016)? If Trump thinks that a record breaking cold night disproves the fact that our planet is warming up, then he really doesn't know enough about global warming to be giving opinions on the subject. You changed the period you were discussing. You first said 1945-1975. 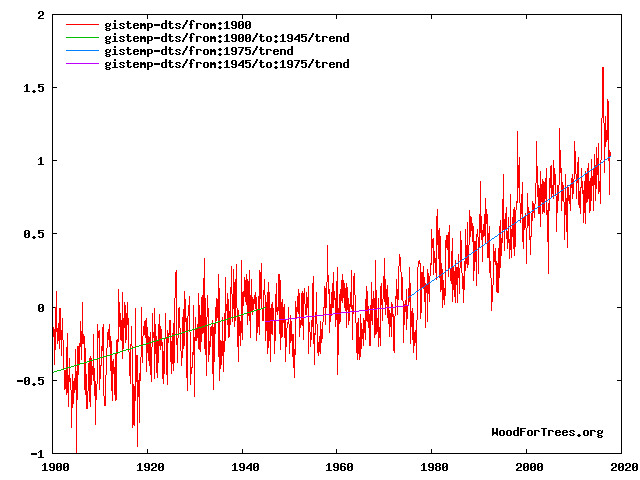 Woodfortrees is using the dataset from NASA but even if it were using a different base period it would only affect the value of the anomaly, not the slope of the trend. But you have taken the difference in endpoints, that is not the same as a trendline. There was a very slight positive trend in 1945-1975. The trend from 1975 to the present is not the same as the trend from 1900-1945, as you claim. But perhaps if the US and Europe go back to producing aerosols at the rates they did in the middle of the last century, and maybe if there are more major volcanic eruptions to throw sulfates into the stratosphere, we could see some flattening. Hell, maybe the Sun actually will cool down too. So let's just keep doing what we're doing. i bet this one is not a real Trump Tweet, but rather one of his staff tweeting under his name. We know now that this happens all the time. The words are too clear, there are no punctuation errors , the sentences are constructed properly and there are no miss-spellings. Nah, most likely Trump himself. Liberals have been underestimated him from the very beginning and you would think they would change their diet, but they're still eating crow to this very day. Liberals should simply stop talking. That way we will only assume that they're stupid, and they won't keep proving it to us. Just over 30 years after a peak in 1944 the average temperature over a 10-year average period is LOWER. As for 1900 to 1944 the average rises by ~0.5 degrees C.
Given the noise in all these charts I call that similar AND over a similar time frame. 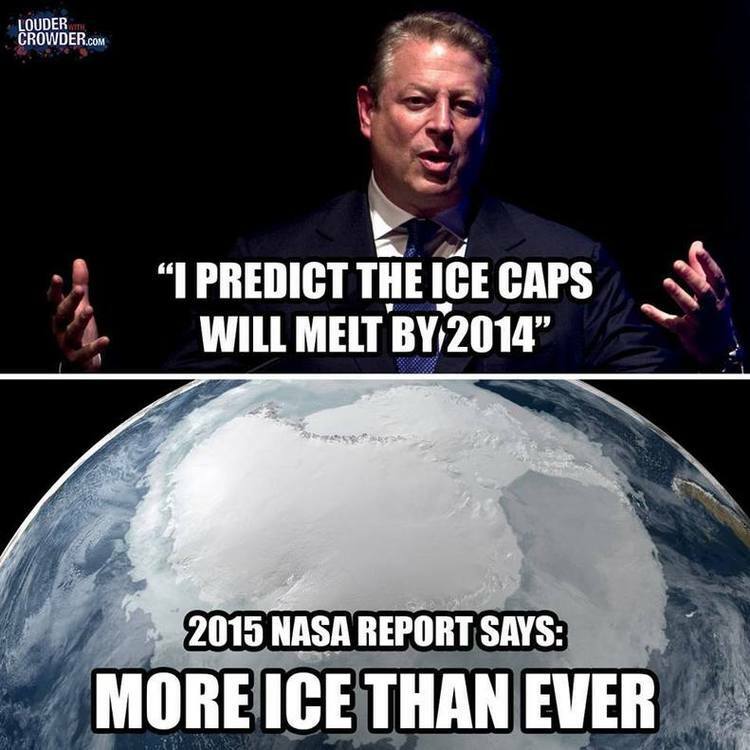 How can we be sure that the average temperature over a 10 year period will not be LOWER than it is today? I'd say yes, stop what we are doing today- i.e. stop all the doomsday scenarios and unnecessary expense and regulation until science develops far better models and can more effectively prove the case. I am gonna guess that you are having trouble comprehending those two pics? What part didn't you get about the truth that most of the rest of us are sharing? Either more ice or not and a pic speaks a thousand words on that one here.